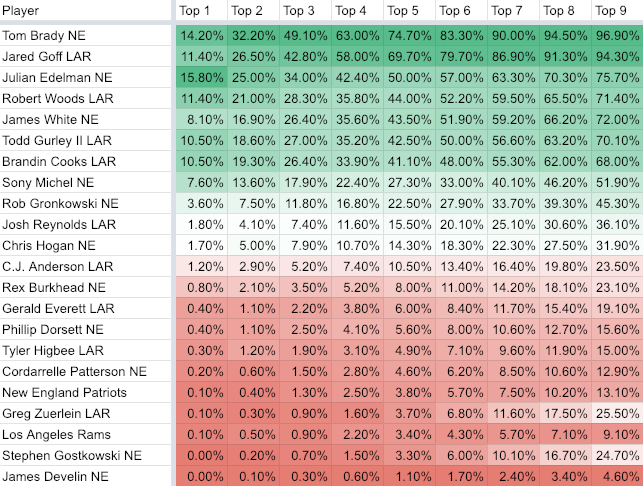 Using our Range of Outcomes projections on DailyRoto, we decided to simulate the DraftKings Super Bowl Showdown Slate between the New England Patriots and Los Angeles Rams. “Proj” on the right-hand side is our default projection from a primary model; it’s what you’d see in our optimizer for Tom Brady. Brady’s fifth percentile projection is 10.3 DraftKings points. That means we would expect Brady to score 10.3 DraftKings points or fewer just five percent of the time. The other 95 percent of the time, we’d expect Brady to exceed 10.3 DraftKings points. Conversely, we’d expect Brady to score 31.3 DraftKings points (his 90th percentile projection) or fewer 90 percent of the time; the other 10 percent of the time, we’d expect Brady to exceed 31.3 DraftKings points. Using this type of model, we were able to simulate 4,000 projections for each player. We then used a correlation matrix for all of the players to reorder those 4,000 projection sets in a way that they reflected the intended correlation matrix. The above chart is in descending order of how often each player finished with a Top 5 DraftKings score in our correlated sims. It’s a good way to get a quick sense of the different floor and ceilings on certain players and positions.